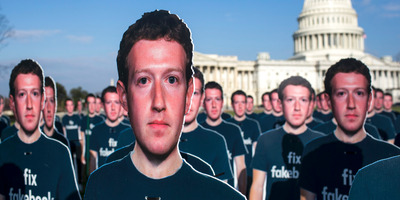 Zach Gibson/Getty Images100 life-sized cutouts of Facebook CEO Mark Zuckerberg sit on the lawn of the U.S. Capitol on April 10, 2018 in Washington, DC. Spoiler alert: There’s nothing to worry about. Impersonating accounts is already against Facebook’s rules, and is easy to detect – both by Facebook and other users. Copy-posting the chain-mail post “warning” about it achieves nothing, so don’t waste your time. Cloning is when a user copies another user’s profile, then uses the information – such as the profile photo and other personal details – to create a new “impostor” Facebook account. It is (obviously) against Facebook’s rules, and a chain-mail-esque post has been spreading in recent weeks, warning of the purported dangers of cloning and asking people who read it to copy and paste it into their own posts, so other users can be warned. If you’re tempted to spread the message, however – don’t. The risk from cloning is minimal, and you’re just wasting your time sharing the message. So should you freak out? In a word: No. Genuine instances of cloning are rare, thanks in part to Facebook’s security and spam filters for new accounts, and there’s an easy way to be sure if you receive a second friend request from someone you know: Just ask them in real life if they sent it. Worried you’ve been cloned? Just search your name on Facebook, and if any suspicious accounts pop up, report them. “Claiming to be another person on Facebook violates our Community Standards, and we have a dedicated team that’s tasked with helping to detect and block these kinds of scams. We have made several recent improvements to combat impersonation, including image recognition technology, automation to detect scams, and improved reporting abilities,” a Facebook spokesperson told Business Insider. Facebook hasn’t noticed any recent increase in impersonations on the social network, they added. What’s more, even if you do copy and paste the message to spread the word, you’re probably just wasting your time, because Facebook’s algorithm penalizes chain-mail messages in its newsfeed – meaning few people will ever even see it.